Air Curtains are installed over the top of doors and pass-thru windows. Our air curtains will help protect your buildings inside environment from windborne dust, dirt, fumes, and flying insects and extreme outside temperature conditions. Not only will air curtains help improve the inside sanitation level of your building, but they will also reduce the operational energy costs necessary to heat and cool it by controlling the air that goes in and out of the opening. How do you choose which air curtain and option is right for me? Heated or none heated, size and type. Contact one of your Experts here at Barr Commercial Door for a FREE Estimate and to find you the right fit for your business. We offer an extensive line of industrial grade air curtains designed to greatly enhance your work environment. 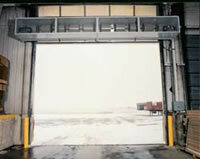 Applications include customer entry doors, receiving doors, and loading dock doors generally part of manufacturing plants, warehouses, distribution centers, cold storage facilities, hospitals, schools, and municipal buildings. Our industrial grade air curtains are designed to produce a discharged air stream with significant strength to resist the infiltration of wind and windborne driven dust, pollen, smoke, and flying insects while at the same time maintaining a building’s desired indoor temperature. Direct benefits derived from its use are enhanced building sanitation levels, increased employee productivity through improved working conditions, higher morale, less employee downtime due to airborne infections and allergens, and reduced costs to heat and cool your building. When used over customer and employee accessible doors, Mars industrial grade air curtains are designed to be manufactured as heated air curtains. The primary sources of heat are electric, steam or hot water coils, and gas. Adding heat to the air curtain will not increase or decrease the effectiveness of the air curtain. Adding heat to an air curtain takes the “wind chill” effect out of the discharged air stream thereby creating a warm “feel good” sensation for those walking through the air stream or working in close proximity to it. Our industrial grade air curtains can be mounted over door openings ranging between 7’-30’; they are manufactured in an electrostatic polyurethane powder coated paint lock metal housing. This feature provides a very durable, long lasting finish. When coupled with the ability to custom paint the housing, the air curtain becomes a natural part of any architectural look or feel. We bring you a dependable lineup of commercial and industrial air curtains that are perfect for managing the environment in your facility, keeping it safe from a variety of external and internal contaminants. These industrial air curtains are also a great way of dramatically cutting down on heating and cooling costs for your property.